JNN 26 Oct 2014 Washington : The ISIS has become the world’s wealthiest terror group, earning tens of millions of dollars a month from illegal oil sales and ransoms, US officials said Thursday. The militant group “poses a different terrorist financing challenge,” as its revenue sources have a different composition from many other terrorist organizations, said David Cohen, the Treasury undersecretary for terrorism and financial intelligence. “We have no silver bullet, no secret weapon to empty ISIL’s coffers overnight. This will be a sustained fight, and we are in the early stages,” said undersecretary for terrorism and financial intelligence David Cohen. The group is now “considered the world’s wealthiest and most financially sophisticated terrorist organization,” said Marwan Muasher, vice president at the Carnegie Endowment for International Peace. “ISIL has grabbed the world’s attention for its outlandish ambitions and astounding brutality, but also for another reason: its substantial wealth,” Cohen told the think-tank. The group’s “primary funding tactics enable it today to generate tens of millions of dollars per month,” Cohen said. Oil sales alone from captured refineries are allowing the militants to produce some 50,000 barrels a day from fields in Syria and Iraq, representing a daily income of about $1 million. The U.S. official said it is difficult to get precise revenue estimates on the value to IS of the transactions in light of the murky nature of the market, but the U.S. estimates that beginning in mid-June, the group has earned about 1 million U.S. dollars a day from black market oil sales. It has also generated about $20 million through kidnappings, particularly of journalists and European hostages. And it demands money from local businesses in cities and towns which it has captured through “a sophisticated extortion racket.” US sanctions would target those found buying illegal oil, Cohen said. This entry was posted in Middle East and tagged David Cohen, financial intelligence, IS, ISIL, ISIS, terrorist organisation, Wealthiest Terrorist. Bookmark the permalink. 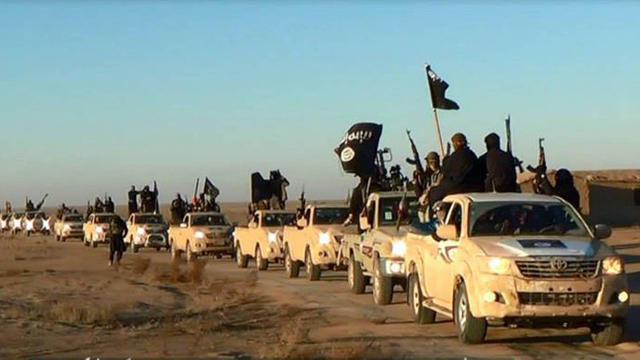 IN THE OPEN THE WHOLE CONVOY IS ROAMING OF INFIDEL ISIL , NEITHER THE GOVT. OF IRAQ OR SYRIA IS ABLE TO BOMB THEM TO DUST NOR THE MIGHTY U.S. FORCES CAN DROP SERIES OF BOMBS TO MIX THEM INTO THE SOIL .. ISNT IT PITY ?